WBA Super World Super Middleweight champion George Groves (26-3, 19 KOs) is hungrier than ever and wants to cross off more achievements on his bucket list. First, he has to get pass ‘ballsy’ Jamie Cox (24-0,13 KOs) in a Muhammad Ali Trophy quarter-final clash October 14 at The SSE Arena Wembley in London where tickets are on sale ranging from from £35 to £130 at stubhub.co.uk at axs.com. This is Cox’s first big fight – whereas you’ve been there for some time – how important is your experience going to be – and do you think Cox can handle the pressure? Cox talks a good game and appears confident – he says you’ve been over indulging – have you still got the hunger? How has your training been going? My training has been going really well. We’ve had plenty of time so we’ve been able to structure a long camp. Everything is on track. You’ve been improving with every fight since teaming up with Shane McGuigan. Do you expect this to continue? Is there still room for improvement? You’ve said you’ve known Jamie a little bit, you roomed together as amateurs, from what you know about him, what do you think his mind set will be going into this fight? Does fighting in London, your hometown, at The SSE Arena Wembley, where you have enjoyed some good nights before, give you an advantage? It’s lovely for me to fight at Wembley. Wembley is good for me because it is so close to home. I can do every moment of preparation in my own surroundings. I’ll be at my own gym, I can sleep at home in my own bed the night before the fight. All these things will be an added benefit come fight night because for me personally, this is how I do best. Tickets for Groves vs. Cox are on sale ranging from £35 to £130 at stubhub.co.uk at axs.com. Danish super middleweight star Patrick Nielsen (29-1, 14 KOs) will meet London’s John Ryder (24-4, 12 KOs, 15 KOs) over ten rounds on the undercard of the World Boxing Super Series quarter-final contest between ‘Saint’ George Groves and Jamie Cox on October 14 at The SSE Arena, Wembley in London. Nielsen, a former World title challenger, has been confirmed as a reserve for the first-round of the inaugural Muhammad Ali Trophy. The 26-year-old from Albertslund, who is currently ranked World number one with the WBA has revealed his excitement to be taking on Ryder in the British boxer’s backyard. “I’m really looking forward to getting in the ring again,’’ he said. ‘’I’m excited to be facing such a good boxer because a good opponent, like John Ryder, will give me the opportunity to showcase what I’m capable of. “Ryder is a bit shorter than me and he likes to come forward to fight. He’s not afraid of getting into a brawl, which suits me well. He is going to be one of the toughest opponents of my career, but I still expect to be victorious. Former WBA International Champion and British title challenger, Ryder, is looking to bounce back after dropping a controversial split decision to Rocky Fielding on April 22, and the 29 year-old Londoner says he is pleased to be involved in yet another 50-50 fight. “I’ve been fighting on the road quite a lot recently. I’ve been in Glasgow, Manchester and Liverpool; so it will be nice to be at Wembley and get a win in front of my home fans”, said Ryder. “Nielsen’s been around for a while now, but I haven’t actually seen much of him. I know that he has been well-matched throughout his career. His only loss came against Dmitrii Chudinov, who is a good level fighter. 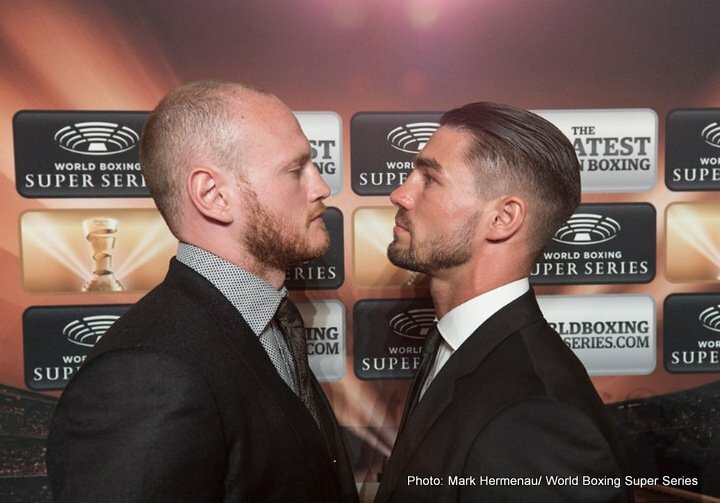 Ryder and Nielsen provide chief support for the quarter-final clash between WBA Super Champion Groves and domestic rival Cox, and Ryder believes the fans can expect a thrilling encounter between the British pair. WBA Super-Middleweight Super Champion George Groves (26-3, 19 KOs) has officially entered the revolutionary bracket-style elimination tournament for the GREATEST prize in boxing, the Muhammad Ali Trophy. The Saint, who comes off a spectacular TKO victory over Fedor Chudinov, is thrilled to defend his belt against the best of the best. “I am proud to bring my WBA Super-Middleweight Title to the tournament. I want to continue to test myself against the best and I am ready and willing to fight anyone. It will be exciting to see who else has the courage to enter such a brutal competition. Roberto Dalmiglio, Comosa´s Head of Management Board, said that things are starting to fall into place. “To begin with, the World Boxing Super Series announced two undefeated world champions for the cruiserweight competition as well a former world champion who is now the number one of the rankings,” he stated. “This week, the tournament welcomed another reigning champion at super-middleweight – a star that at a young boxing age has already filled Wembley Stadium and has been involved in so many top broadcast events. Richard Schaefer, Comosa`s Chairman of the Americas, is excited about Groves´ participation. “The Saint is not only the WBA Super-Middleweight Champion but also definitely the hottest name in the division right now,” he stated. “There is never a dull moment in his fights and that is what makes him a stand-out participant of the inaugural season of the World Boxing Super Series. In the inaugural season of the World Boxing Super Series, 16 elite fighters – eight super-middleweights and eight cruiserweights – will battle out a bracket-style elimination tournament. In both divisions, there will be four quarter-finals (September / October 2017), two semi-finals (early 2018) and one final (May 2018), making for a total of 14 high-class fights. The World Boxing Super Series is delighted to announce that two more undefeated fighters have signed up for the Muhammad Ali Trophy, The Greatest Prize in Boxing. Erik Skoglund (26-0, 12 KOs) and Jamie Cox (22-0, 12 KOs) have joined a star-studded tournament line-up that already features four reigning world champions and two former world champions. The duo will compete in the super-middleweight competition, with WBA Super Champion George Groves among the potential opponents. Swedish sensation Skoglund, the IBF´s number 4, will be coming down from light heavyweight where he is unbeaten in 26 fights and top-ranked with all major governing bodies. “It´s unbelievable to be fighting for The Greatest Prize in Boxing, the Muhammad Ali Trophy,” the 26-year-old said. “I can´t describe how excited I am. Like Skoglund, Great Britain´s Jamie Cox will also put his unbeaten record on the line as he enters the revolutionary bracket-style elimination competition. “I’m excited to be joining the World Boxing Super Series,” the 30-year-old said. “This is great opportunity. I’ve never shied away from a challenge and I’m looking forward to testing myself against the top names in the division. “I think the tournament format will suit me well, and this will be a chance for me to show everybody what level I’m at. I know I’m capable of winning. I’m ready to show the world what I’m all about. “Maybe people will see me as the dark horse of the tournament. If that’s the case, I’m ready to cause a shock. I train very hard and I’ve done it in the gym before with top champions and now I’ve got the platform to do it on the world stage. With Skoglund and Cox on board, the World Boxing Series now features five undefeated fighters, as world champions Gassiev, Dorticos and Briedis, who will compete in the cruiserweight competition, have not tasted defeat before either. In the inaugural season of the World Boxing Super Series, 16 elite fighters – eight super-middleweights and eight cruiserweights – will battle it out in a bracket-style elimination tournament. In both divisions, there will be four quarter-finals (September / October 2017), two semi-finals (early 2018) and one final (May 2018), making for a total of 14 high-class fights. The quarter-finals will be set during a live Draft Gala at Monaco`s famed Grimaldi Forum on July 8, with the top seeds (determined by the Comosa Board) picking their opponents from the unseeded boxers.